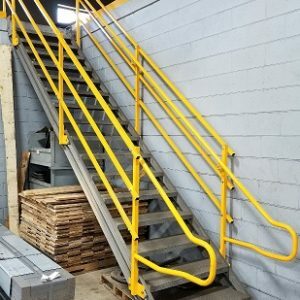 Stairways and Structural Stair Systems, Stair Handrails, and Safety Rails compliment the many Safety Barrier / Guard Rail type products offered through Omega Industrial Products. Omega Industrial Products, Inc. carries and manufactures Handrails and Stairways designed to meet any adopted building codes. Steel Handrails and Safety Rails are designed from pipe and structural tubing, constructed from heavy gauge steel to meet OSHA fall-protection requirements. Omega’s adjustable-height Stairways offer an enduring flexibility simply not found elsewhere. Our Industrial Stairways are built from quality, heavy-gauge steel and come in a variety of tread designs. All the components of our Industrial Stairs are pre-manufactured and matched to each individual application. The exclusive Omega design is ingeniously based on the concept of a parallelogram to provide vertical adjustability that can eliminate costly mistakes from mismeasurement, change in floor heights during construction, or uneven floors. With the Omega system, once you set the top and bottom treads to the prescribed rise, the rest of the trends fall into a uniform rise and run. All components are pre-manufactured and matched to each individual application. Omega Quick-Step Stair Systems apply a unique approach to structural stair systems, right up through our Safety Handrails and Stair Handrails, which incorporate many unique advantages. We don’t skimp on safety or soundness so our customers don’t have to compromise either. Omega products are exactingly devised and engineered to surround your most valuable assets with real-world, proven protection. Our Interior and Exterior Stair Systems are designed and manufactured to minimize employer and employee worry and maximize safety, soundness, and trust. Nothing shows your commitment like solid industrial-grade, tensile-strength steel: Omega Stairways and Systems, from Stair Treads to Handrails and Safety Rails, attest to an employer’s attitude about the facility, the workforce, and everything that implies. All of our Stairways can be easily customized to your specific needs and dimensions, whether they be height, length, color, location, or functionality. Request a quote and we will contact you.